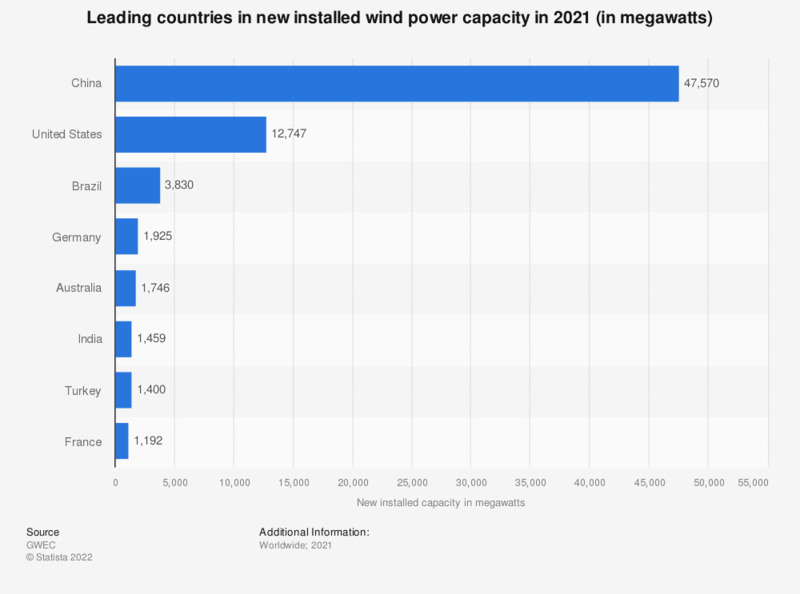 This statistic represents the leading wind power countries in 2017, by new capacity installations. The United States added approximately 7.02 gigawatts of wind power capacity in this year. Some forty years ago, the major industrialized countries were rendered helpless in the face of a severe energy crisis, when Arab petroleum producers proclaimed an oil embargo and the Iranian energy industry was plunged into the chaos of revolution. Once more, politicians and the public in industrial countries were reminded of the finite and limited nature of fossil fuels. The lack of alternatives to oil, gas and coal energy lead to the development of renewable, sustainable energy technologies, including solar thermal and PV systems, hydroelectricity and wind power. In terms of cumulative wind power capacity installations, the market used to be dominated by European economies. However, beginning in the mid-2000s, China emerged as the driving force behind global wind power capacity growth. In 2014, Asia’s economic power horse added a whopping 23.35 gigawatts of new wind power capacity, to reach cumulative capacity of almost 115 gigawatts. With a market share of just under 30 percent in 2013, China lead the ranking of the largest wind power countries worldwide, ahead of the United States, Germany and Spain. Chinese wind turbine manufacturers have also started to steal market share from the leading players - including General Electric Energy, Siemens and Vestas - in the 58.5 billion U.S. dollar global wind power equipment market. That said, Europe still accounts for about 90 percent of global cumulative offshore wind power capacity. * This figure is provisional. ** Projects fully commissioned, grid connections pending in some cases.